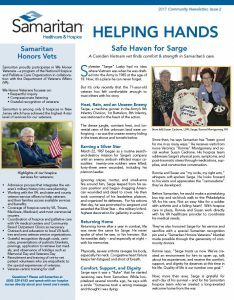 In this Fall 2017 edition of the Samaritan Hospice Helping Hands newsletter, we meet Sarge Lusby, a Vietnam War veteran who has found a safe haven in Samaritan. Also learn more about the many upcoming educational events. Download our newsletter now! In this Spring 2017 edition of the Samaritan Hospice Helping Hands newsletter, we meet Marie Ann Stewart who, with the help of Samaritan’s services, was able to fulfill her mom’s wish of dying comfortably at home. Also, you can view photos of The Samaritan Center at Voorhees dedication, annual gala, and new board members. Download our newsletter now! In this Fall 2016 edition of the Samaritan Hospice Helping Hands newsletter, we discuss how spiritual support counselors help hospice patients and their families. Plus, we discuss how inpatient hospice care differs from routine hospice care, and the importance of keeping your financial plan up to date. 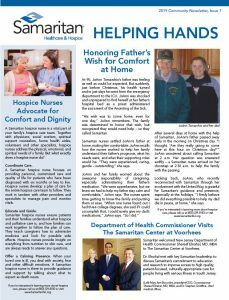 Download our hospice newsletter now! In this Spring 2016 edition of the Helping Hands newsletter, we meet Ravi, and read about his hospice experience. Plus, we discuss The Samaritan Center at Voorhees ground breaking, the #BeforeIDie festival, how we’re honoring veterans, and much more. Download our newsletter now! In this edition of the Samaritan Hospice Helping Hands newsletter, we are introduced to eight women had journeyed together through grief and rallied through mutual support in Samaritan’s Daughters without Mothers support group. Plus we share hospice tips by Consumer Reports, our annual gala sponsors, and the prestigious honor we received from the U.S. military. Download our newsletter now! 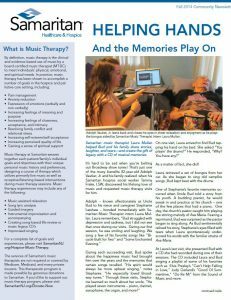 In this edition of Helping Hands, we meet Laura Mullen, Samaritan music therapy intern, and learn how her work with Uncle Bud helped his depression and sadness. Plus, learn how you can make the most of your charitable contributions. Download this newsletter now! In this edition of Samaritan’s Helping Hands newsletter, read about Myra’s dream to get her master’s degree and how her Samaritan social worker helped to make it happen. Plus, we discuss how Samaritan honors veterans, expanded our Global partnership, and launched a Timely Conversations initiative. Download this newsletter now! In this edition of Samaritan’s newsletter, meet World War II veterans Carol and Ethel Zickafoose. Enjoy their love story and how Samaritan honored them for their service to our country. Plus, meet John Gillespie, a grateful and humble board member who is passionate about Samaritan’s services. Download this newsletter now! To view lists of 2016 donors, please visit our Thanking Our Donors page. In this 2015 edition of Samaritan’s annual report to the community, we learn about the number of people we’ve impacted with our palliative care, hospice care, inpatient hospice care, grief support, volunteer, and education services. | Read Samaritan’s 2015 Report to the Community now! 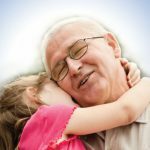 Samaritan hospice care promotes physical, emotional, and spiritual quality of life – as you definite it. Palliative care, comfort and support at any stage of illness, helps you regain relief and control. Download our hospice and palliative care brochure today! Each year, Samaritan is the grateful beneficiary of memorial gifts. These gifts are in loving memory of patients who received our care and help to sustain Samaritan’s charitable mission. Download our brochure today to learn more! A new way to remember or honor your loved one. Memorial pavers will be installed at The Samaritan Center at Voorhees. Download our brochure to learn more! An invitation to membership in the Circle of Caring. With gifts over $100, members have an immediate, beneficial effect on the lives of Samaritan’s patients and their families. Download our brochure today to learn more! An invitation to membership in the Legacy Society — a special group created to recognize the many loyal friends who have established a personal legacy in support of Samaritan’s comprehensive services. Download our brochure now to learn more! This select society was created to recognize those who have made an extraordinary personal pledge to promote Samaritan’s excellent care in our community. Download our brochure now to learn more! This elite group was created to recognize our strong network of community-minded business, corporate, and foundation donors. Download our brochure to learn more!